Sabbath & Feasts ‘Nailed To The Cross’? Tim, I have been reading your site for a while now andÂ now have a question i hope you could help me with. I was raised in a church that taught we are to keep all of gods holy days and Sabbath (WCG). I still believe in Sabbath keeping, but not sure about holy days. Are we still to keep them? or were they nailed to the cross? I don’t belong to this church anymore, they have split into many different churches now. I am really confused about holy days if you have any way to explain this subject to meÂ it would be very welcome. Thank You for your time. Feasts Nailed To The Cross? In the Greco-Roman world, the â€œrecord of debtâ€ (Gk. cheirographon) was a written note of indebtedness. Paul uses this as a word picture to characterize each personâ€™s indebtedness to God because of sin. God himself has mercifully resolved this problem for all who put their faith in Jesus by taking this note and nailing it to the cross, where Jesus paid the debt. The image comes from the notice fastened to a cross by the Roman authorities, declaring the crime for which the criminal was being executed (see John 19:19-22). Thus this “certificate of debt” illustration does not refer to the Torah. It refers to the guilt from sinning against God. Jesus came to cancel that debt, not to do away with Torah. Taking away the Torah would not remove the guilt it had already brought. To be sure, Jesus said he came to fulfill the Torah, not to destroy it (Mt 5:17). He could not destroy it as the Torah would not fade away until heaven and earth passed away (Mt 5:18). Before that time, when the Kingdom comes, the Torah would be required again and be taught by the rulers in the kingdom (Mt 5:19). In other words, the Torah is prophetic. It must all be fulfilled. My site’s main article talks about this whole topic. Sabbath And Not Feasts Required Today? James 2:10-11 (HCSB) 10 For whoever keeps the entire law, yet fails in one point, is guilty of âŒŠbreaking itâŒ‹ all. 11 For He who said, Do not commit adultery, also said, Do not murder., So if you do not commit adultery, but you do murder, you are a lawbreaker. Galatians 3:10 (HCSB) 10 For all who rely on the works of the law are under a curse, because it is written: Everyone who does not continue doing everything written in the book of the law is cursed. The Sabbath is commanded first in Exodus 16. It’s later repeated in Exodus 20 in the Ten Commandments. The Feasts are in Leviticus 23. They are all part of the same Torah, even if SabbathÂ is listed in the Ten Commandments and Feasts are not. Also, Leviticus 23 groups both the Sabbath and feasts together as “my appointed times”. This is where the problem comes in when people say you have to keep any part of the laws given to Ancient Israel under the Old Covenant such as tithing, Sabbath, feasts, unclean meats, etc. They are “all for one and one for all.” You cannot say one is required without acknowledging the rest as required. I used to always wonder how the WCG could teach requirements of unclean meats, feasts, tithing and Sabbath but ignore the sacrifices, stoning of idolaters, witches and disobedient children, laws of niddah, wearing tassles, build sukkahs/tabernacles, and so many other laws. How did they know which ones were for today and which ones were not? Well, I see now they obviously did not know. They were picking and choosing and modifying where needed (hotels = temporary dwellings = sukkahs/tabernacles). All this to answer your question: if you are convicted you need to keep Sabbath, then according to the Bible you should be convicted as well that you need to keep the annual feasts days. This, I admit, may be not the kind of “help” you wanted as it opens up a can of worms! How are you going to do commanded sacrifices or tithe crops with no temple or Levites and priests around? Or how many men have the funds to travel to Jerusalem three times per year to keep the feasts in the one place where God “placed his name” (Dt 14:23; 16:2; 26:2)? The answers are: You can’t and indeed very few have the funds to keep Torah. Anyway, this is what the Bible literally teaches on this question and it is up to each of us to determine for ourselves what to do with it. There are no prophets, judges, Levites or priests today with authority over us in these matters to guide us, unlike what Ancient Israel had as part of the Old Covenant to make Torah “not too difficult” (Dt 30:11-14). New Jerusalem – No Gentile Gate? + Rom 11 Olive Tree – Israel? In Revelation 21, there are 12 gates to the New Jerusalem for the 12 Tribes of Israel. There are no gates for “Gentiles.” Hence, Messiah cannot marry any Gentile woman until she joins his tribe! Ruth is a prophetic “type” of the remnant in the “Gentile” Christian Church who join the House of Judah and then she was able… to marry Boaz who is a “type” of Messiah. Those outside of the gate are “dogs” and Yahushua (sic) called the Cannanite woman a “dog” which is a nick name for a “Gentile.” So those outside of the gate are Gentiles/Dogs. You cannot inherit the Kingdom as a Gentile, you must be converted by the Jewish Messiah to become like him—-a Jew! Revelation 21:10-12 (NIV) — 10 And he carried me away in the Spirit to a mountain great and high, and showed me the Holy City, Jerusalem, coming down out of heaven from God. 12 It had a great, high wall with twelve gates, and with twelve angels at the gates. On the gates were written the names of the twelve tribes of Israel. It’s an interesting theory about the purpose of the twelve tribal gates. It makes sense at first until you realized there is an assumption behind it that is neither provable nor sensible. Revelation 21:14 (NIV) The wall of the city had twelve foundations, and on them were the names of the twelve apostles of the Lamb. In other words, each gate for each tribe is sitting a top a different foundation with the name of the assigned apostle. Obviously these are named to honor the twelve apostles, each of whom will rule one of the twelve tribes (Mt 19:28). Perhaps their name will be under the gate for the tribe they rule. But using the logic above, only the twelve apostles can pass beyond the gate their name is written under. For that is what the naming of the of foundation must mean…exclusive access, right? Wrong. The real problem with accepting that we all must be assigned to one of the tribes to be in the Kingdom and New Jerusalem is the many places where it is emphasized that “there is neither Jew nor Gentile in the Kingdom” (Gal 3:27-29). If we all must “become Israel,” then why did Paul look forward to when we are “in Christ” instead of once we are “in Israel” as Messianics teach? After I saw all the verses contradicting this “Become Israel for Salvation” theology, I took another look at the Romans 11 Olive Branches grafting. This is another passage often cited as proof that we must become Israel. It is believed that there is one olive tree described that we are grafted into as Gentiles and it is Israel and therefore we become Israel by being grafted there. But does it say that? If you look closely, you find out that there is more than one olive tree. Olive branches are among them based on keeping the “holy root” tree pure and righteous; not for the purpose of making wild branches natural or Israel branches. It never says or implies that. In fact, the first olive tree we are grafted into is called the “elect” (Ro 11:7) or “righteous remnant according to grace” (Ro 11:5) by Paul, not “Israel.” If the hardened unrighteous original branches of this remnant tree are removed and the righteous wild branches from the other olive trees are added, this means we can’t have that olive tree be the “Israel tree.” It’s the righteous remnant tree, a tree of mixed olive branches; some natural to that tree, and some wild or cultivated. However, all are remnant righteous branches only “by grace” and not by nationality or being or becoming Israel. The root of the olive tree that sustains the righteous branches is Christ, not Israel (Jn 15:5). Gentiles are not called dogs in Revelation, the unrighteous are. Gentiles do not need to live in Israel or become Israel/House of Israel/House of Judah/Jewish/etc.Â to be saved or blessed. They need to believe in the Word of God and do it just as Israelites need to (Lk 8:21; Gen 15:6). When they do, they are in Christ receiving his grace, and their Jewishness or Gentile-ness is not counted, as Paul said. In the New Jerusalem, all who have become righteous and have white clothing will be able to go through all the gates (not just “one gate” or “their own gate”). Revelation 22:14 (NIV) “Blessed are those who wash their robes, that they may have the right to the tree of life and may go through the gates into the city. People are surprised that I take the time to answer their emails. Yes, I am busy with a young family and living in Costa Rica makes everything take longer to accomplish. For example, yesterday I had to hit a few places to find a replacement NVidia video card with the HDMI connector I needed. Not complaining…I enjoyed walking in the warm sunny weather in between the stores. It just takes longer. But what readers do not know is that I love answering questions. I love the blessings that come from questions. One big one is the provision of new insights through the Socratic method. Questions force you to think, something we all tend to avoid whenever we can =). But in thinking you can mine some great discoveries from even old elementary topics you thought you mastered long ago. Six Years of Planting Required? I still lean towards the 50 year cycle because if Israel goes back to work right after the jubillee Sabbath year, they will be breaking the command to work 6 years and rest the 7th, since they will then be only working 5 years and resting the 6th year after the jubilee year. I had never heard such an objection to a 49 year Jubilee cycle. I had to stop and think about it. He was right that a 49 year Jubilee cycle “broke” the six years of planting mentioned in the Sabbath year command. You ended up with only five following a Jubilee year before the next Sabbath year. I had to admit that I had not thought of the Sabbath year command as requiring Israel to plant for six years on their fields. Was he right? I decided to give it a chance and to think it through. Six Days of Work Required, Too? If this was true about the Sabbath year command then it must be true about the Sabbath day command as well. By this line of interpretation, the Sabbath day commandment would require Israel to work six days just as much as they were commanded to not work on Saturday by it. But immediately I saw a problem with this. What about when you are sick? By this interpretation you still must work. What happens when you want to take a vacation for a week? You cannot or you are breaking the 4th Commandment, “Six days you must work.” Or is that what the 4th Commandment says? The interesting part here is “do all your work”. Not God’s work. God has not commanded average Israelites to do any work in particular during the week days. That would be God’s or “my work”. Instead he tells Israel to do “all your work.” If Israel had no work to do then they did not have to do anything for six days. If an Israelite had enough money to provide for his own, then the Sabbath commandment is not telling him to make busy work for show. If he wanted to take a vacation, then there was no prohibition on that. The intent of the Sabbath day command is obvious when you think it through. The intent was for Israel to not overwork themselves seven days per week. They would keep Saturday set apart to reconnect with their family and God. Once I realized the above, I knew the same applied to the Sabbath year commandment. What if an Israelite bought a field and did not have the money to plant it. Was he breaking the Torah in doing nothing with his field for six years? No. As long as he did not decide at last to plant in the 7th year when all Israel was keeping field fallow, then he was in compliance with the intent of this command. Failure to leave fields fallow causes agricultural yields to diminish eventually. Then farmers resort to unnatural means to coax the field into producing what it used to. Chemical fertilizers and pesticides. The people eating the food pay the price for that in their health through the modern diseases we have today (not that toxins and poorer nutrition from food is the only cause of disease). The passage supports that the planting is optional during the six years. It says “may”, not “must”. Leviticus 25:3 (HCSB) 3 You may sow your field for six years, and you may prune your vineyard and gather its produce for six years. What About Six “Planting Optional Years” Before a Sabbath Year? You still might wonder if a 49 year Jubilee year cycle does not at least break Scripture. Does not the Sabbath year have to follow six “planting-optional years?” Is that not the intent? Once again, I believe we must think it through to get the true intent. The true intent is to establish a seven year cycle. The commandment names six years and one year. Six plus one equal seven. That’s a seven year cycle. Now we must understand that commandments of the Torah can override each other. We see this with the Sabbath Day commandment. Jesus pointed out that the priestly duties were done on Sabbath, “profaning it” (Mt 12:5). This was their main work, yet they did it on Sabbath. They had a special case that overruled the general blanket command of ceasing from labor on Sabbath. That is what is happening here with the the Jubilee command. It is overriding the detail that there are six years available for planting before a Sabbath year. It is saying that the first year of the 8th (15th, 22nd, 29th, etc.) Sabbath year cycle is not going to be for planting, but will be a special Jubilee of no planting (among other things) following the preceding Sabbath year of no planting making two years of no planting in a row. The 49 year Jubilee cycle maintains the strict seven year cycle for Sabbath years just like the Torah gives for Sabbath days every seven days. The objection that having the Jubilee year be one of the six planting years of a Sabbath year cycle breaks Scripture does not hold. When you properly understand the intent and focus of the Sabbath year on preventing overwork of fields, you can see that it does not require planting in any year or for any number of years. The Sabbath year command simply forbids Israel to plant in the special seventh year, just as the Sabbath day command simply forbids Israel from working on Saturday. I have heard about a mandatory H1N1 vaccine that the US is going to force us to take the vaccine or go to a concentration camp. Have you heard about this? It is supposedly going to start as soon as October 15, 2009. If you have heard anything or have any advise I would greatly appreciate your response. There are always rumors like this about draconian laws coming or concentration camps for resistors. I’ve heard and watched these fables come and go for years. You know what I’ve found? They never come to pass. Most often they were just unfounded or false rumors. There is a good reason mainstream news sites do not carry such stories. They cannot be verified. This of itself does not make them false, but most unverifiable stories do turn out this way. Perhaps a few rumors are based on actual plans of the enemy which failed as most plans men make up do. Finally some may have been real plans and had a real chance but they contradicted God’s master plan. Of course, God is sovereign and his plans never fail. In hindsight, most of the above may seem like common sense, even academic. But common sense is not always very common. The next time you hear an extreme rumor like this, I hope you treat it as it deserves. As an unsubstantiated rumor. (or Even A Natural-Born American Citizen)? â€œIn the beginner’s mind there are many possibilities, but in the expert’s mind there are fewâ€â€”Shunryu Suzuki. 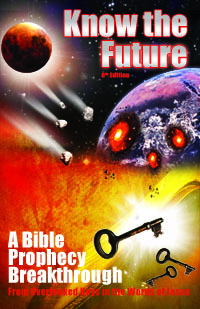 As an expert on Bible prophecy, I can attest to the applicability of that principle in my field. I constantly hear beginners pose Bible prophecy theories that are frankly impossible. Usually there is a clear and plain verse that nullifies the beginner’s theory. One clear verse is all that it takes because of the principle Jesus taught that â€œthe Scripture cannot be brokenâ€ (John 10:35). We are not to believe a doctrine that would contradict the Bible. The Bible is a big difficult book that takes years to become expertly familiar with so false doctrines are commonly passed around and accepted. Case in point: is Obama the Antichrist? Lately, this is the question I receive most frequently since he became President of the United States. Besides questions, I receive plenty of emails from people trying to convince me that Obama is the Antichrist. I think people send them because of the article on my website that uses Revelation 13 to identify someone else as the Antichrist. Obama Antichrist theorists naturally view the article as wrong and just have to correct me. One person even told me to take the article down so people are not â€œmisleadâ€ by it. The article is still up even though I admit it is possible that the suggested candidate is wrong. We just will not know he is wrong until that person dies or the real Antichrist appears, whichever comes first. In the meantime discussion on the topic is good and one of the best ways to get people to actually study the Bible for themselves. As for Barrack Obama, we can disqualify him as an Antichrist candidate today. This theory is about as valid as the common Christian belief that â€œJesus can come back at any momentâ€ (the secret pretrib rapture). To the beginner both theories seem possible. An expert can tell you that both theories are contradicted by plain clear Scripture. Barrack Obama does not fulfill a single major identification requirement for the Antichrist, especially not from Revelation 13. The â€œpeopleâ€ who would destroy Jerusalem and the temple were the Romans, but v. 27 makes clear that this â€œrulerâ€ will be the future persecutor of Israel during the seventieth seven. â€œThe people of the rulerâ€ does not mean that the people â€œbelong toâ€ the ruler but rather that the ruler will come from these people. If the text is to be taken literally at this point, this future ruler will come out of the peoples and nations that made up the ancient Roman Empire. Daniel already had divulged in chap. 7 that the Antichristâ€™s origin will be from the fourth empire, Rome. The country that Obama is from and rules did not even exist as country until 1700 years later. Therefore, a US Citizen cannot be the Antichrist because they are from a country that was not part of the Roman Empire who destroyed the Temple. When I tell this to Obama Antichrist proponents, they usually ignore the evidence and invoke the â€œbirtherâ€ conspiracy theory you may have heard in the news. It states â€œObama was not born in the USAâ€. I suppose one wild theory deserves another to back it up. Anyone who would believe the first could easily entertain the second. But even if this argument were true, it would make no difference because Daniel’s prophecy was not referring to the nation the Antichrist comes from. He was referring to what nation he is from. Making Obama a Kenyan does not help since Kenya was not part of the Roman Empire either. Let’s be reasonable. If it were true that Obama was not qualified to be president, then the McCain campaign would have pounced on this Anyone who was willing to make the risky move of choosing Sarah Palin for vice president certainly would have used this angle if it had any solid evidence behind it. In fact, it recently came out that the McCain campaign did investigate this angle before the election. They found it to be unsubstantiated and the proof of Obama’s birth in Hawaii to be well-documented. If only believers would consistently do likewise: investigate theories in the Bible themselves and only believe what is well-supported there. We would have a very different set of doctrines taught and widely believed if so. And we would have a lot more Bereans (Acts 17:11) than we do now. Am I down on people who fail to do this and entertain or spread these weak Bible theories? Not at all. I remember some of the crazy doctrines I used to entertain when I was a beginner and had not learned clear thinking skills yet. I write what I do here to help those who want the truth and need a little help finding it just like I did when I was still a beginner. Although I am now an expert, I keep learning to grow in grace and knowledge and correct my own errors. snopes.com: Is Barack Obama a natural-born citizen of the U.S.?